Misfit's step counter and sleep tracking can now sync with Android phones, though support for the Pebble Time's color screen is still missing. 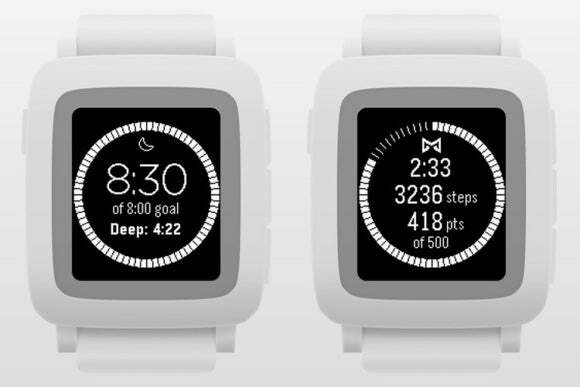 Since last fall, Pebble smartwatch users have been able to count their steps and track their sleep, but they’re on their own in deciding which third-party fitness app to use. An update to Misfit’s Pebble app should make that decision a little easier. The app, which can automatically switch between step counting and sleep tracking, now syncs with Android phones, and improves existing sync capabilities to iOS. This allows users to view long-term fitness trends, share their accomplishments with friends, and set their own fitness goals using Misfit’s smartphone apps. Misfit isn’t the only step and sleep counter for Pebble watches, though it’s the only one we’ve found that switches to sleep mode without explicit user input. And unlike Jawbone’s Up app for Pebble, Misfit claims to tell the difference between light and deep sleep without a dedicated fitness band. You might get better results through a combination of specialized apps, such as Morpheuz for sleep and Runtastic for exercise, but Misfit is the best all-around, low-maintenance solution. Still, the app isn’t perfect. Some Android users have complained of “ghost steps” in the latest version, and Misfit still isn’t supporting the color display on the new Pebble Time smartwatch. Why this matters: The combination of sleep tracking and step counting is one of Pebble’s big selling points over the Apple Watch and Android Wear watches, both of which demand a recharge after a day of solid use. By comparison, the Pebble lasts up to a week, and the Pebble Time lasts about five days in our experience, making them much more conducive to overnight wear. With smartphone syncing, Misfit’s app feels more like a complete solution for users who want to obsess over every detail.